Fascinating people from Dallas? Apparently, that me. I know... crazy! 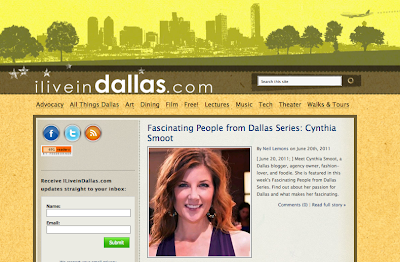 But the folks over at I Live In Dallas are starting a new series profiling interesting or "fascinating" people in this city and they wanted to start with me. Still trying to figure that one out... but what the heck. I'm rolling with it. Click here to read the Q&A. My humble thanks to Neil Lemons. I am honored to have the spotlight shone on me and this blog.